In this day and age, when our children are exposed to media and technology at every moment, you want to make sure you make the best decisions in what they are exposed to. Right now, over 3.5 million children around the globe are playing a Kid’s Academy App! My own children included! Some of our most favorite Kid’s Academy apps are The 3 Little Pigs & The Big Bad Wolf, 123 Tracing and my personal favorite – the Montessori Workbook. Your family can play the Montessori Workbook for FREE from iTunes! This great app has been in the TOP 10 of the most popular in the Education category for the U.S. market for the last 5 weeks! Kid’s Academy apps are created with fun in mind! They engage young minds with graphics, music and intriguing games! Although this app is rate for ages 4+, my newly 3 year old plays it with no problems at all. Toddlers can start with the easier skills and then gradually build on their better developed skill levels. Both of my children are able to work on this app at age appropriate levels, even though they are 2.5 years apart. Children are rewarded by collecting fireflies throughout their game play. Children are also given hints to help build their skills and more importantly, their confidence! The curriculum your child will work on is developed by preschool education experts and is aligned to common core standards. Available for your iPhone or iPad. As a parent, you probably find the reviews people leave on products to be helpful in your decision making process. Kids Academy feels the same way. When you leave a review on their apps, it helps other parents know this is an age-appropriate app for their child and it helps Kid’s Academy to continuously work on their apps to bring you the best. It is so important to use kids screen time for valuable things. This app is great for teaching a lot of skills all in one place! 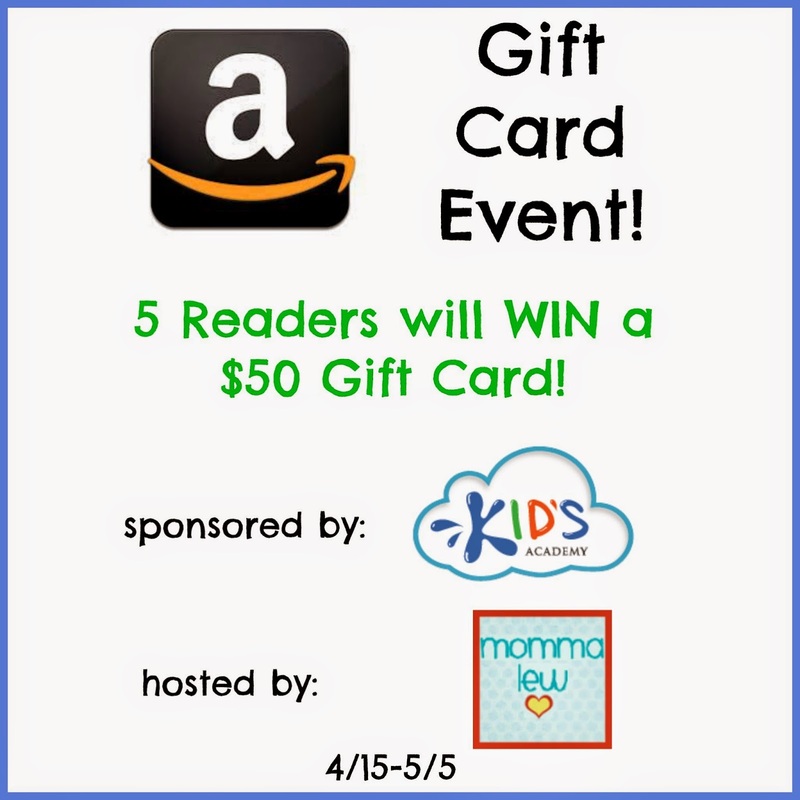 To say thank you for leaving a review on this new app, Kid’s Academy will be giving away FIVE (5) $50 Gift Cards to Amazon! Leave a review of at least a few sentences! Then, come claim your entries here in the Entry Form to be entered to win 1 of the 5 $50 Amazon Gift Cards! This giveaway is open worldwide to readers 18+ and ends on 5/5/14 at 11:59pm EST. All entries will be verified, one entry per household. Winners are emailed and have 48 hours to claim their prize before a new winner will be chosen. *Momma Lew’s Blog received compensation for this post and all opinions expressed were not influenced in anyway. Promoting Bloggers are not responsible for prize fulfillment. Next post: YOU Can win one of several $25.00 Gift Cards!